Students learned how to make pa variety of chutneys and salsas during the fourth Preserving the Harvest series class of the summer on Monday, Aug. 29, at the Sitka Kitch community rental commercial kitchen. The chutneys and salsas class was taught by Lisa Sadleir-Hart, with assistance from Betsy Decker. 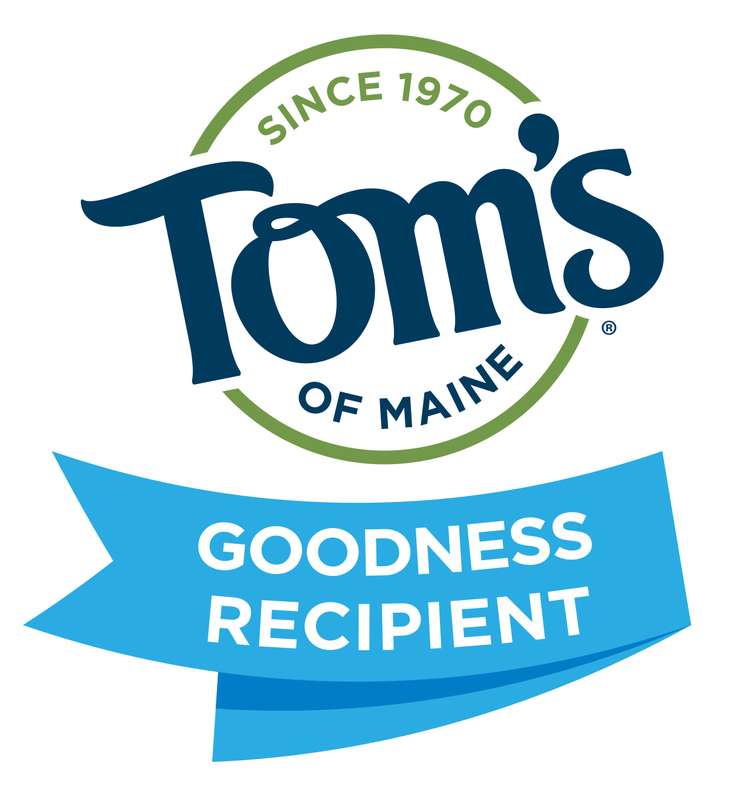 It is one of six classes in the Preserving the Harvest class series, which will teach people how to safely preserve the summer’s bounty so it can be eaten in the summer. Other classes in the series will include simple pickles and sauerkraut, low-sugar jams and jellies, canning salmon, chutneys and salsas, apple and fruit butters, and a community kale celebration. More details can be found at this link. 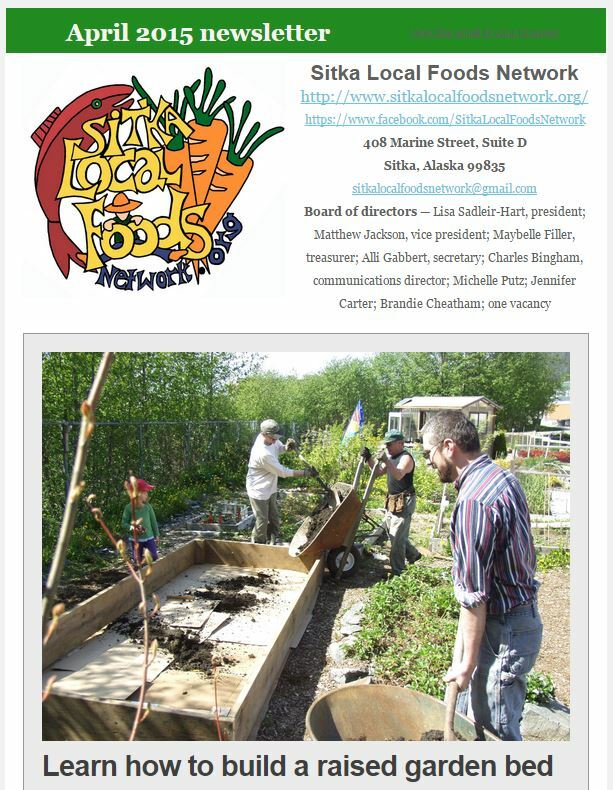 The Sitka Kitch was a project of the 2013 Sitka Health Summit, and the project is coordinated by the Sitka Conservation Society in partnership with the Sitka Local Foods Network. 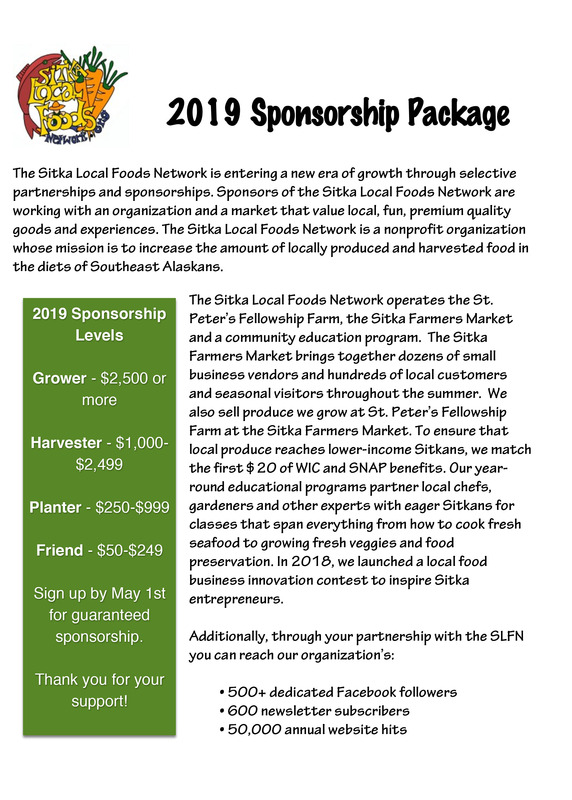 The Sitka Kitch can be rented to teach cooking and food preservation classes, by local cottage food industry entrepreneurs who need a commercial kitchen to make their products, and for large groups needing a large kitchen for a community dinner. To learn more about how to rent the Sitka Kitch, please go to the website at http://www.sitkawild.org/sitka_kitch. The next class in the series will be apple and fruit butters, from 6-8:30 p.m. on Monday, Sept. 12, at the Sitka Kitch. To register for classes, go to our online registration page at http://sitkakitch.eventsmart.com/ and click on the class name. We now have a PayPal option so people can pay the registration fees before the class. There are food/supply fees for most of the classes, which are split between the students, and those are paid by cash or check (made out to the Sitka Conservation Society) at the class. Other than for the Kale Celebration event, each class has a limited number of spots available, so register early. Registration for each class closes at 11:55 p.m. on the Friday before the class. If you have any questions about the class series, please email sitkakitch@sitkawild.org. A slideshow of images from the chutneys and salsas class is posted below. Students learned how to make pickles from squash and small-batch sauerkraut at the first Preserving the Harvest series class of the summer on Monday, July 18, at the Sitka Kitch community rental commercial kitchen. The Simple Pickles and Sauerkraut class was taught by Lisa Sadleir-Hart, with assistance from Jasmine Shaw. It is one of six classes in the Preserving the Harvest class series, which will teach people how to safely preserve the summer’s bounty so it can be eaten in the summer. Other classes in the series will include low-sugar jams and jellies, canning salmon, chutneys and salsas, apple and fruit butters, and a community kale celebration. More details can be found at this link. To register for classes, go to our online registration page at http://sitkakitch.eventsmart.com/ and click on the class name. We now have a PayPal option so people can pay the registration fees before the class. There are food/supply fees for most of the classes, which are split between the students, and those are paid by cash or check (made out to the Sitka Conservation Society) at the class. 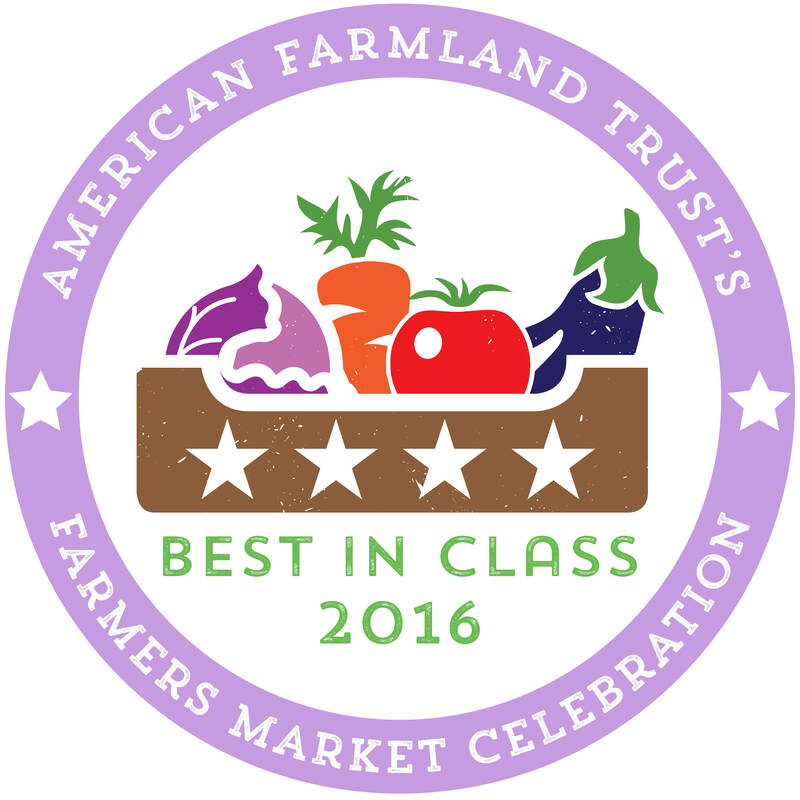 Other than for the Kale Celebration event, each class has a limited number of spots available, so register early. Registration for each class closes at 11:55 p.m. on the Friday before the class. If you have any questions about the class series, please email sitkakitch@sitkawild.org. A slideshow of images from the simple pickles and sauerkraut class is posted below. You grew it, harvested it and/or caught it, so now what do you do? The Sitka Kitch community rental commercial kitchen will be offering the Preserving the Harvest class series to teach Sitkans how to store the summer’s bounty so they can use it during the winter. Community Kale Celebration — 6-8:30 p.m., Monday, Sept. 26, Cooking demonstrations featuring kale recipes by chefs Kathy Jones and Barbara Palacios (not a class), entrance fee $10. In a story that’s going to have a lot of digits, the number 12 might be the most important. 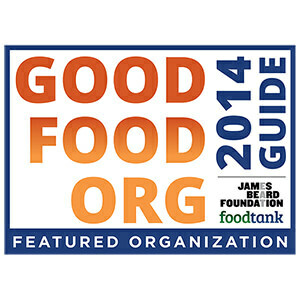 All canned goods have a coded number on the bottom that gives the location of where the food came from, when it was canned and who packaged it. If the code on the bottom of canned salmon starts with a number 12, it means it was canned in Sitka. It also means the Sitka Sound Science Center received a one-cent donation for the production of that can of salmon. And — if you’re Silver Bay Seafoods CEO Rich Riggs — it’s also a call-out to the fans of your favorite football team. “So if you’re a (Seattle) Seahawks fan, that’s good news,” Riggs said. Silver Bay has just wrapped up the inaugural year of its canning operation. 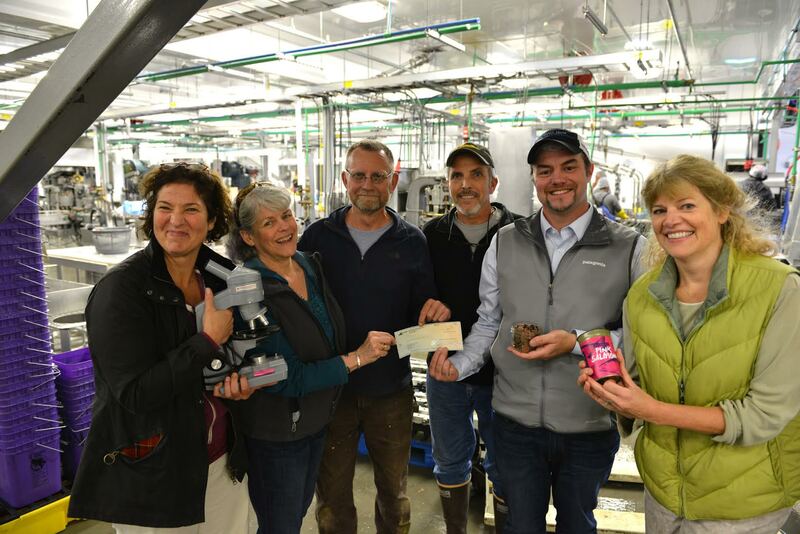 The $7 million capital investment was the latest expansion of the Sitka-based company, founded in 2007 at the old Alaska Pulp Corp. mill site where it processed salmon for the fresh and frozen fish market. Before Silver Bay Seafoods started canning fish there hadn’t been a cannery in Sitka for more than 50 years. Earlier this week Riggs gave a tour of the canning line to the Sitka Sound Science Center board of directors. It was to celebrate a partnership between the two in which Silver Bay donated one cent for every can that rolled off the line. 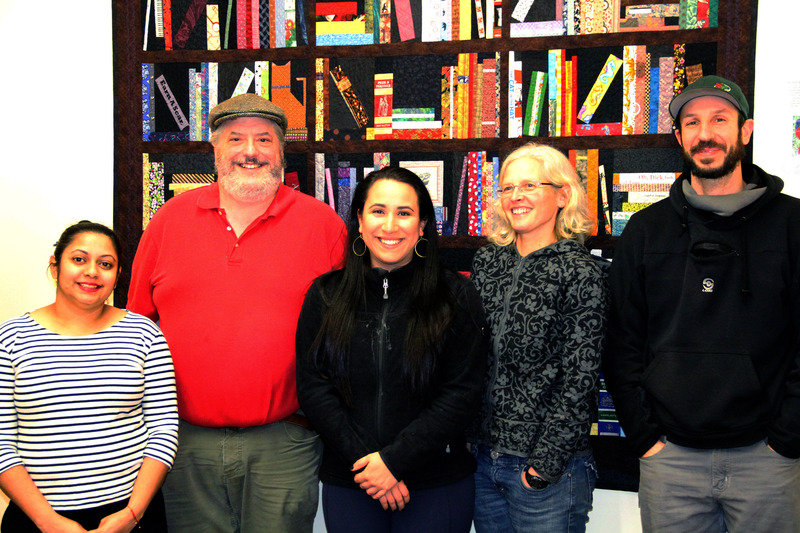 Sitka Sound Science Center Director Lisa Busch said it’s one of the best examples there is of an industry supporting research in its own field of business. Riggs said the rationale for that connection is obvious at any fish hatchery in the state. And then there’s the fact that the Sitka Sound Science Center is heir to the fishery science program pioneered by Sheldon Jackson College, which closed in 2007. “You look and a lot of managers in the state have had some educational component at SJ. We firmly believe that sustainable fisheries are critical to Alaska’s communities and Alaska fishermen,” Riggs said. Canning operations started in the second week of July, with three lines for three different sized cans. The largest cans run through the system at a rate of around 250 per minute, and the other sizes at around 215 cans per minute. To the Sitka Sound Science Center, 60 minutes of canning results in a donation about equal to the hourly rate of some attorneys. 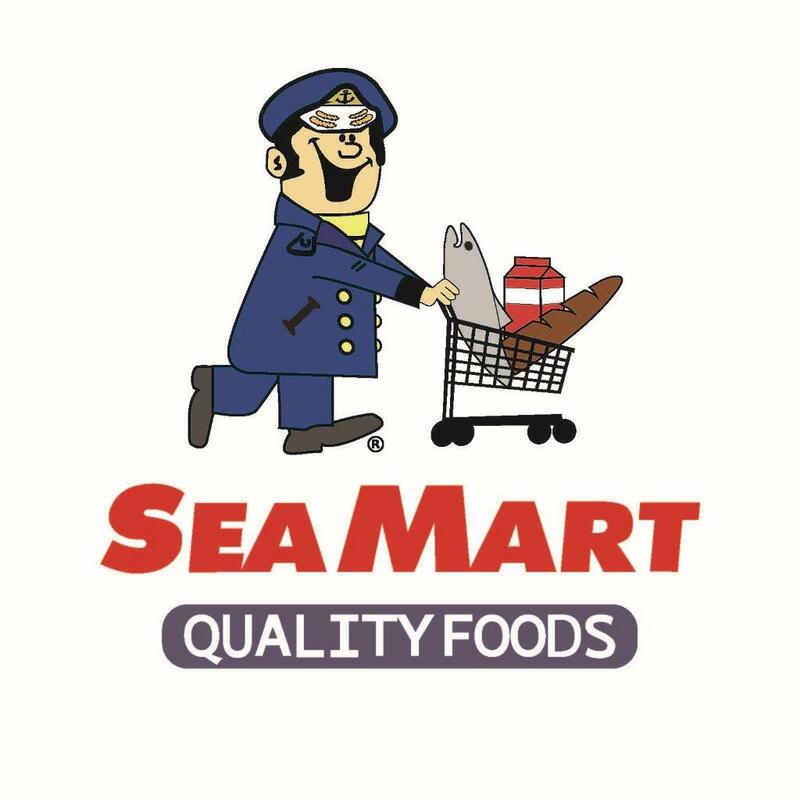 Because of business interests, Silver Bay Seafoods won’t disclose how many cans it produced this year, but the first payment to the Sitka Sound Science Center was for $75,000. The new canning line expands the total Silver Bay Seafoods warehouse footprint to more than 80,000 square feet, Riggs said. The expansion was headed up by Mike Duckworth, who has 34 years of experience building and maintaining canning lines. One of the first things he had to do was acquire all the pieces, because most of the key elements for canning salmon date back to before his career even started. The technology dates back to the 1930s and ’40s, and Duckworth said the last major production of filling machines ended in the ’60s. 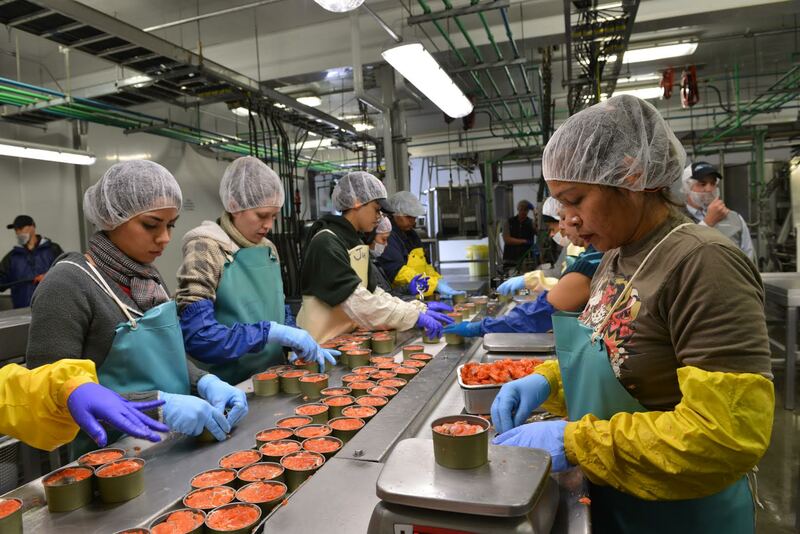 “Our equipment was probably cast in the late ’40s to the ’50s,” Duckworth said, adding that rebuilding those filling machines is a key piece of canning salmon in Alaska. 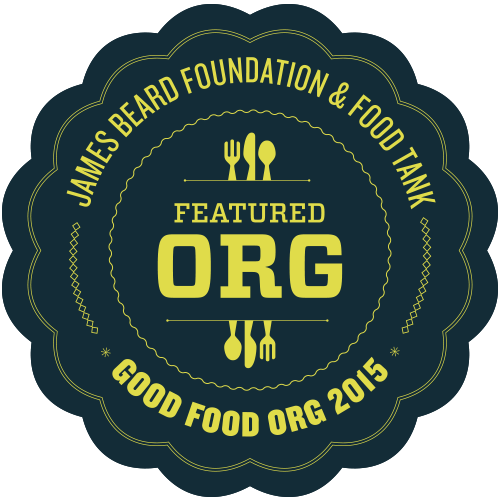 The old equipment is then blended with new systems to create the modern canning system. “That plant, it’s just a good blend of the old technology and the new,” Duckworth said. A special slime line handles the salmon destined for canning, processing them in the usual manner. The fish are fed into one of the three canning lines where more than a dozen employees help monitor the process. As salmon move along the line, they are packaged in cans that drop down a track from a room in the second story of the warehouse. A machine fills the can while employees check for bones and quality. Between the machine that affixes the lid and the track that kicks out defective cans is a printer that marks each can with a code, all of which start with the number 12. Once sealed, the cans are loaded onto carts and taken to a separate station to cook before being stacked, wrapped and loaded into trucks to send them as far away as Australia. Despite a low salmon year, Riggs said the canning operation was close to its projected target this season and there’s room to grow next year. Tuesday (Sept. 8) was the last day of canning for the year, and it was frozen Bristol Bay sockeye that went through the process. The majority of the fish processed this year, however, cam from Southeast Alaska. And if things continue to run as they did this year, the canning line also will allow for continued research into fisheries at the Sitka Sound Science Center. Funding for independent science centers in Alaska can be tough to come by, and Busch said it can often be from unrelated industries, such as oil. Silver Bay Seafoods has worked with the Sitka Sound Science Center in the past, for example in the center’s cost-recovery fishery, and this new program is a logical continuation of their partnership, Busch said. 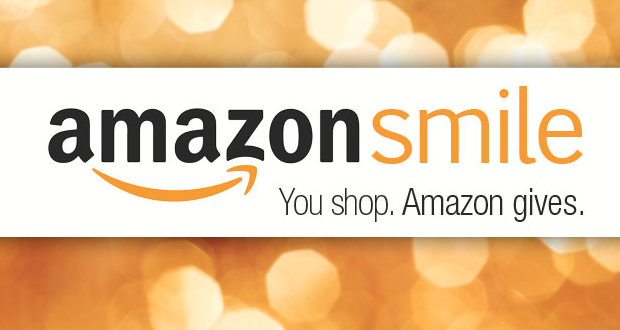 Or, as Silver Bay Seafoods and the Sitka Sound Science Center are putting it, salmon makes cents. 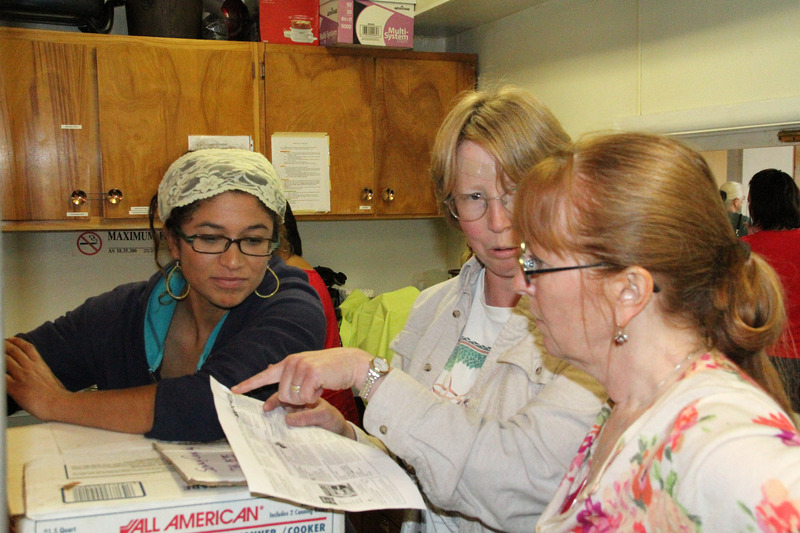 On Aug. 6-8, the Sitka Seafood Festival hosted Leslie Shallcross from the Anchorage District Office of the University of Alaska Fairbanks Cooperative Extension Service to teach a series of food preservation classes at the Sitka Kitch community rental commercial kitchen (Aug. 6-7) and Sweetland Hall on Sheldon Jackson Campus (Aug. 8). Leslie taught a class on Thursday at the Sitka Kitch about how to make low-sugar jams and jellies (a class on preserving local garden greens was canceled), and on Friday she taught a class on making kelp pickles and sauerkraut and a class on canning salmon. On Saturday, she moved over to the Sweetland Hall to be closer to the Sitka Seafood Festival events and she taught another canning salmon class and a class on the process of smoking salmon. Also, don’t forget to make sure your pressure canner gauge is tested at least once a year. Jasmine Shaw from the Sitka District Office of the UAF Cooperative Extension Service has a tester in her office and you can call her at 747-9440 to schedule a test. 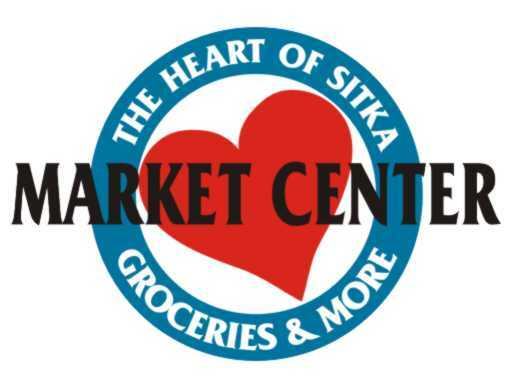 For more information about the Sitka Kitch project, go to the Sitka Kitch website or Facebook page. For rental information, contact Kristy Miller at sitkakitch@sitkawild.org. Click this link to take a quick tour of the facility. A slideshow with scenes from the various classes is posted below. 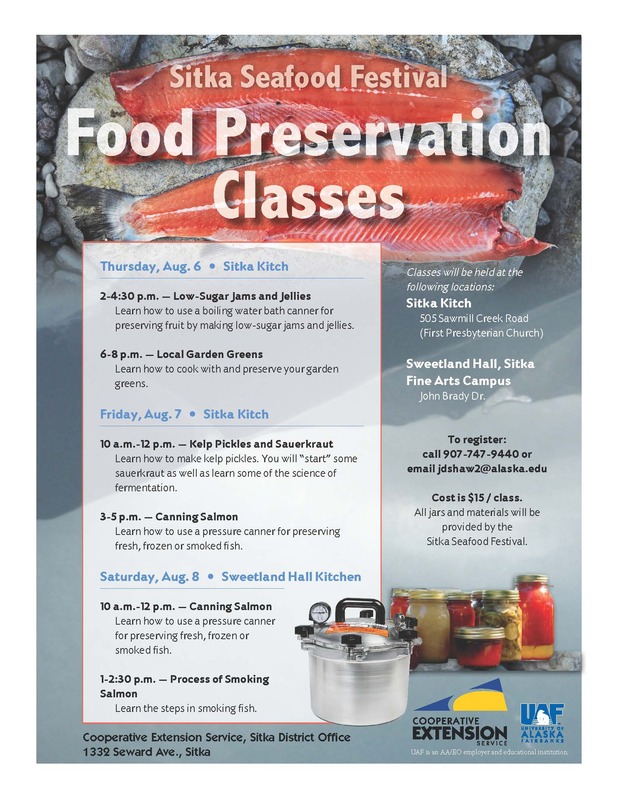 Leslie Shallcross from the University of Alaska Fairbanks Cooperative Extension Service‘s Anchorage District Office will be in Sitka to offer a series of food preservation classes on Aug. 6-8 as part of the Sitka Seafood Festival. 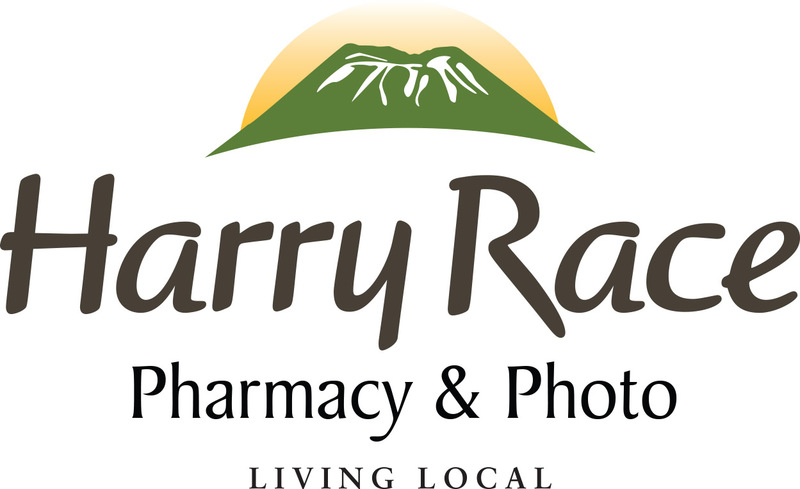 The classes on Thursday and Friday, Aug. 6-7, will take place at the Sitka Kitch community rental commercial kitchen (inside First Presbyterian Church, 505 Sawmill Creek Road), while the Saturday, Aug. 8, classes will be at Sweetland Hall on the Sheldon Jackson Campus. Each of the classes will cost $15, but jars and other materials will be provided by the Sitka Seafood Festival. Thursday, Aug. 6, 2-4:30 p.m., at Sitka Kitch — Low-sugar jams and jellies — Learn how to use a boiling water bath canner for preserving fruit by making low-sugar jams and jellies. Thursday, Aug. 6, 6-8 p.m., at Sitka Kitch — Local garden greens — Learn how to cook with and preserve your garden greens. Friday, Aug. 7, 10 a.m. to noon, at Sitka Kitch — Kelp pickles and sauerkraut — Learn how to make kelp pickles. 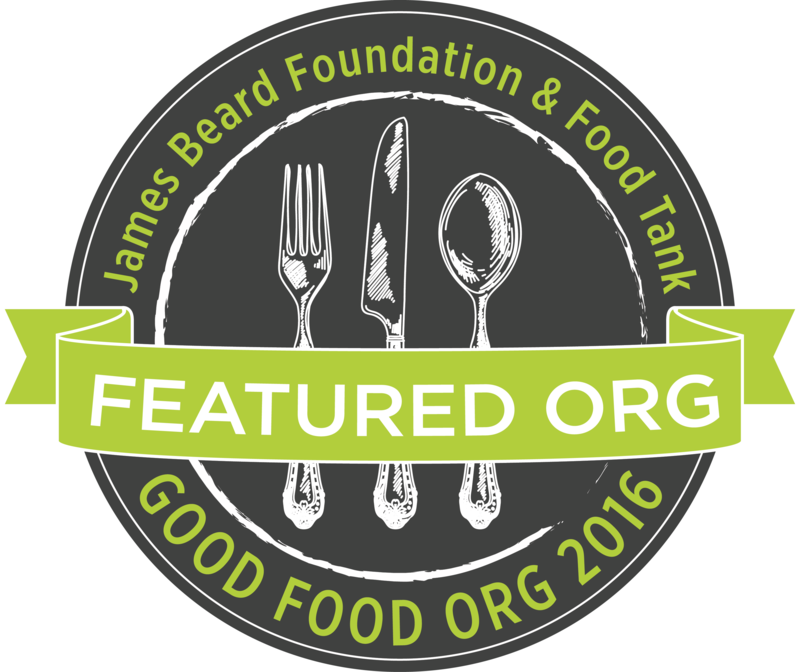 You will “start” some sauerkraut as well as learn some of the science of fermentation. Friday, Aug. 7, 3-5 p.m., at Sitka Kitch — Canning salmon — Learn how to use a pressure canner for preserving fresh, frozen or smoked fish. Saturday, Aug. 8, 10 a.m. to noon, at Sweetland Hall — Canning salmon — Learn how to use a pressure canner for preserving fresh, frozen or smoked fish. Saturday, Aug. 8, 1-2:30 p.m., at Sweetland Hall — Process of smoking salmon — Learn the steps in smoking fish. For those who might miss the classes but still want to learn more about home canning, the UAF Cooperative Extension Service has a series of online tutorials on its website called “Preserving Alaska’s Bounty.” Also, don’t forget to make sure your pressure canner gauge is tested at least once a year. Jasmine Shaw from the Sitka District Office of the UAF Cooperative Extension Service has a tester in her office and you can call her at 747-9440 to schedule a test. To register for the classes, please contact Jasmine Shaw at 747-9440 or jdshaw2@alaska.edu.